In his latest act of defiance against the Western powers who are seeking to oust him from power, Venezuelan leader Nicolas Maduro on Sunday expelled a team of five visiting European lawmakers, according to AFP. 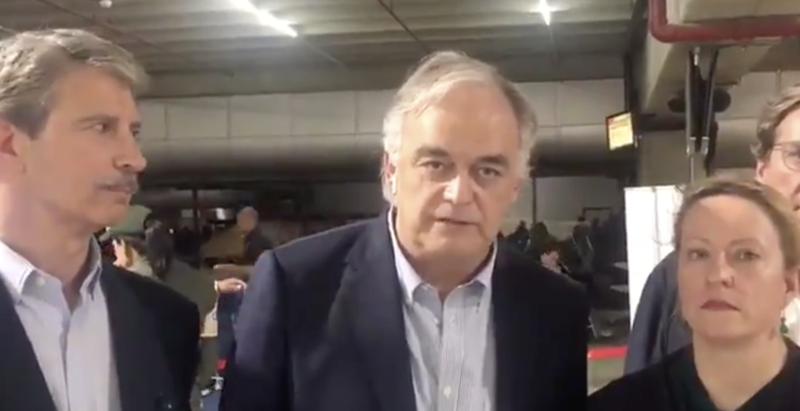 One member of the delegation, Spanish MEP Esteban Gonzalez Pons, who was in charge of the delegation, took to twitter to warn that "our passports have been seized" and that "they have not informed us of the reason for the expulsion." The group was invited to Venezuelan by opposition leader Juan Guaido, and had professed to be on a fact-finding mission to discern the true nature of the circumstances on the ground. Pons recounted the saga of traveling to Venezuela, having the delegations' passports seized and then being expelled from the country, in a lengthy twitter thread. He claimed that the only explanation for their rough treatment was that Maduro "doesn't want us here." Hoy salgo hacia #Venezuela invitado por la Asamblea, con la intención de mantener una reunión de trabajo con @jguaido y ayudar en lo que podamos desde la Unión Europea a esta patria hermana que tantísimo está sufriendo. Mírenme para que pueda cumplir esta misión parlamentaria. Somos conscientes de que podemos no ser bien recibidos por quienes no deseen que Europa vea lo que está sucediendo en #Venezuela por eso si podemos iré contando aquí cómo estamos y si nos permiten trabajar. Gracias y hasta esta noche. Today I leave in a @EPPGroup mission to #Venezuela invited by National Assembly. We will meet with @jguaido and will work on how EU can help this brotherly country that is suffering so much. Look at me so we can fulfill our parliamentary mission. Altogether with me are @GabrielMatoA @Esther_De_Lange @PauloRangel_pt and Ignacio and Juan Salafranca. Our aim is not no provoke but to peacefully meet with can tell us the situation on in the ground. And yes ask for the release of all political prisoners. We’re aware we may not be very welcome from those who doesn’t want Europe seeing what’s going on in #Venezuela. That’s why I’ll be tweeting how we are and if we’re allowed to work. Thank u and see u tonight! Just landed in Venezuela.During our stopover in Santo Domingo, both EU & Spain ambassadors have informed us we will be either retained or expelled. We’re MEPs with an official invitation from National Assembly. As Maduro moves to block humanitarian aid shipments organized by the US, Guaido has been gaining the support of more members of the international community. Currently, roughly 50 countries recognize him as the legitimate ruler of Venezuela, including some 30 countries in Europe. Pons was expelled along with fellow Spanish MEPs Jose Ignacio Salafranca and Gabriel Mato Adrover, as well as Esther de Lange of the Netherlands and Paulo Rangel of Portugal. All are members of the conservative European People's Party (PPE). In response to the expulsions, Guaido blasted Maduro as "isolated and increasingly irrational" in a tweet. Meanwhile, as piles of humanitarian aid - including food, hygiene kits and nutritional supplements - have been stockpiled across the border in Cucuta, Colombia, Guaido has set a deadline of Saturday - one month to the day since he declared himself the legitimate ruler of Venezuela - as a deadline for a showdown over the aid with Maduro.